A study of Northwestern freshmen finds undergrads fare better when taught by non-tenture-track faculty. We all know the stereotype about tenured college professors: great researchers, lazy teachers. After all, you don't get tenure by dazzling 18-year-olds with PowerPoints. You do it by convincing other academics you're a genius in your field who's going to bring boatloads of grant money and prestige to campus. And nobody ever won a grant by grading papers. A gross oversimplification? Of course. But there might also be a hint of truth in the caricature, at least judging by a new study from Northwestern University. The paper--co-authored by university president Morton Schapiro, professor David Figlio, and consultant Kevin Soter of The Greatest Good--finds that faculty who aren't on the tenure-track appear to do a better job than their tenured/tenure-track peers when it comes to teaching freshmen undergraduates. Previous studies have suggested that colleges tend to hurt their graduation rates by hiring more part-time and non-tenure faculty. But Shapiro and his team wanted to measure the impact of tenure on "genuine student learning," a notoriously tricky task. So how'd they do it? Using the transcripts of Northwestern freshmen from 2001 through 2008, the research team focused on two factors: inspiration and preparation. To start, the team asked if taking a class from a tenure or tenure-track professor in their first term later made students more likely to pursue additional courses in that field. So, to borrow their example, if an undergrad took economics 101 from an adjunct, and political science 101 from a tenured professor, were they any more likely to sign up for additional poli sci classes. That's the inspiration part. Second, the researchers wanted to know if students who took their first course in a field from a tenure or tenure-track professor got better grades when they pursued more advanced coursework. So, if our hypothetical student took more classes in both economics and poli sci, what did they fare better in? That's the preparation part. Turns out, tenured and tenure-track professors underperformed on both the inspiration and preparation fronts. Controlling for certain student characteristics, freshmen were actually about 7 percentage points more likely to take a second course in a given field if their first class was taught by an adjunct or non-tenure professor. * They also tended to get higher grades in those future courses. Taking an intro class with a non-tenure track instructor increased a student's mark in their second class by between .06* and .12 grade points, depending on controls. The freshmen who got the biggest boost tended to be less academically qualified students, judged by SAT scores and such, in the hardest subjects. As the study notes, these patterns held "for all subjects, regardless of grading standards or the qualifications of the students the subjects attracted..." In other words, the non-tenure-track faculty bested their more established colleagues every from English to Engineering. Now time for a few disclaimers, some from the paper, some my own. As the authors note, this paper only looks at freshmen. Tenured professors might very well might do better in advanced junior and senior-level courses where they can incorporate their own research and special expertise into their curriculum and have a chance to work with students who've accumulated a bit more specialized knowledge. Also: Northwestern is a tony private university that attracts highly qualified faculty to work as adjuncts and non-tenured instructors. Who knows if these results would hold up at a typical state university. Beyond that, I would have liked to see these results broken down a little further. Do tenure track professors, who are struggling to publish as much as possible to impress their colleagues, fare better or worse than faculty who are already set with tenure? 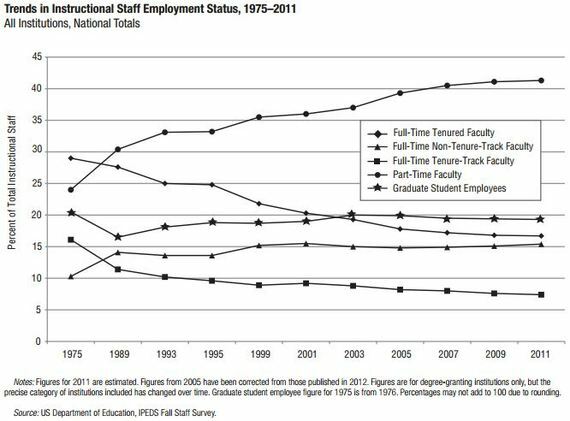 And are adjuncts really just as good full-time, non-tenured faculty? It's not clear. These questions matter, because as I've written before, the defining trend among college faculties during the past 20 years or so (40, if you really want to stretch back) has been the rise of the adjuncts. More than ever, colleges today rely on part-time, non-tenure track instructors to teach their students. And we should know what the effects of this switch add up to. That said, there is something appealingly intuitive in these results. Professionals who are paid entirely to teach, in fact, make for better teachers. Makes sense, right? Full disclosure: I graduated from Northwestern in 2008, meaning my academic record was part of this study. *Correction, Sept. 9, 4:55 pm: An earlier version of this story initially stated that the range was .6 to .12. *Correction, Sept. 11, 7:35 AM: An earlier version of this article stated that the difference was 7 percent, rather than percentage points.